System for the determination of glucose for self testing use. Convenient, accurate and cost effective. A valuable tool to keep a diabetes diary, including FASTING / NO FASTING or control solutions markings. 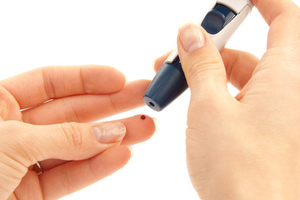 A blood glucose meter measures a person's glycemia level, the concentration of glucose in the blood. These devices are used by diabetes sufferers to monitor their blood sugar levels. This facilitates medication and diet management, for example insulin injections for those with type 1 diabetes. Most meters are used with small, disposable test strips holding a drop of blood. However, certain models are equipped with a lancing device with built-in strips on a roll. Some can be used in speaking mode, while others may be linked to a wireless network to send data to a remote monitoring station. There are also combination meters which also check temperature, cholesterol, acetonemia, lactose and other levels. The meter must be chosen with the needs of the individual patient in mind. Ease of use, portability, response time and data storage capacity are other important factors.